As I mentioned yesterday in my random thoughts, I am in love with my Fitbit Charge. If I am being honest, I never really knew if I would jump on the fitness tracker bandwagon. I felt like there were too many options to choose from. 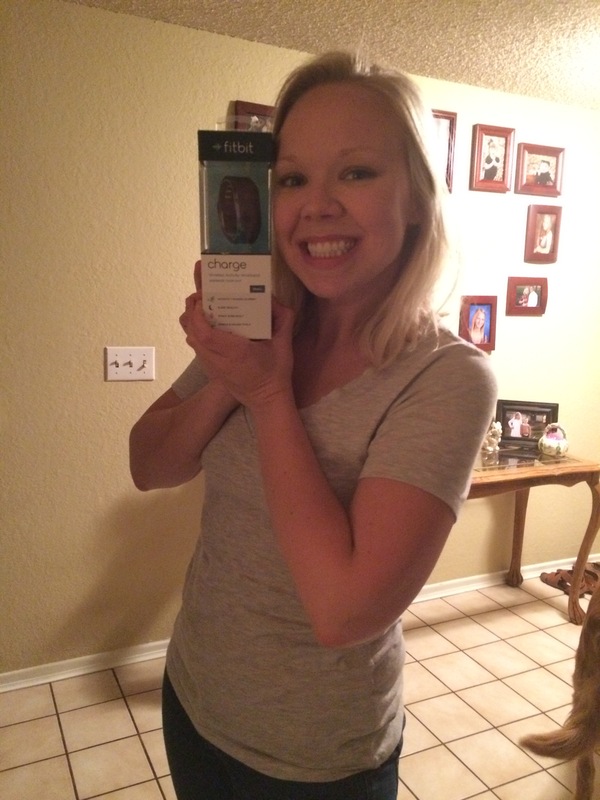 I got lucky because I was able to borrow a friend’s Fitbit for a week while running Ragnar. Within two days of using the Fitbit Charge I knew I had to have my own. After using the Fitbit, I found myself taking the dog for more walks and taking stairs whenever I had the option. 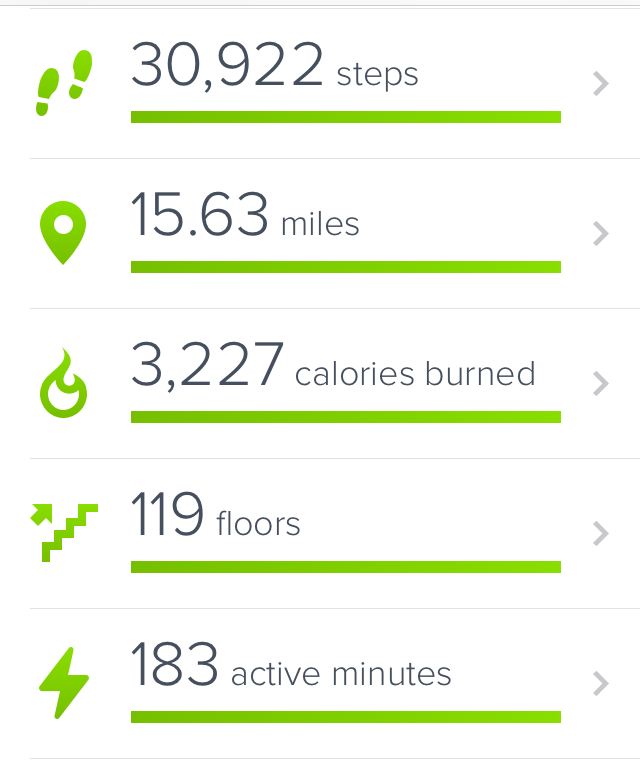 I already lead an active lifestyle but the Fitbit has made me move more during my daily routine, especially at work. Working an 8-5 desk job and having back issues is not a good combination but wearing the Fitbit tracker, I find myself getting up more to take breaks, walk to the copier and stand up more often. The simple concept of the Fitbit is that it makes you more aware which in turn helps to increase your movement. Although I love my Fitbit there are a couple of things I had to look past but the pros by far weigh out the cons. The simplicity– I am fairly decent at figuring out new technology but the Fitbit was the easiest to start using. I didn’t read the manual until 2 weeks after having my tracker. It is that easy to get set up and ready to use. The same goes for the app- easy to download, sync and start using. No one wants to spend days just trying to figure out how to use a device. The app– the Fitbit app has become one of my most daily used apps. I love having all the information from my Fitbit at the touch of my IPhone. The app also notifies you when you are getting close to your goal. The notifications I receive help to motivate me to get more steps and stay active. Just ask my husband how many times in the past week we have taken an extra walk with Emma so I can get to my goal. The app also has a breakdown of each category that is tracked. You can see day, week and month comparisons. Overall the app helps to keep all your fitness information in one central location. This in turn helps you to find areas of improvement and recognize your strong points. I also like that the app can also act as a food, water and body weight tracker. You have the ability to add your calorie count, water intake and weight into the app. This allows you to not only track the information but use your fitness information to give you even more stats to work with. 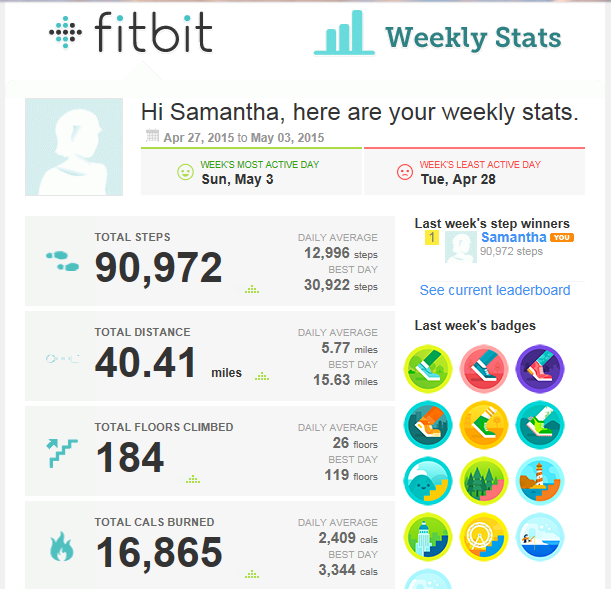 Weekly stats email– In addition to the daily you receive on the tracker and app, Every week I get an email from Fitbit with my averages. I love getting the comparison to see what areas I am lacking in as well as which days I am most active. Having this information readily available again helps to make you more accountable and aware. Plus the weekly updates are great motivation and encouragement when you see improvement from week to week or day to day. The sleep tracker– Beyond the fitness information, the tracker also tracks your sleep pattern each night. While I can’t speak to the accuracy of the sleep tracker, it has definitely opened my eyes to how horribly I sleep each night. While I may be in bed for 6-8 hours, I am not actually sleeping for all of it. The sleep tracker tells you how long it takes you to fall asleep, how many times you are restless during the night and how long you actually slept. Information like this can be eye-opening to explaining why you are tired all the time and hopefully help to make improvements. The customization– Every tracker can be set up to your preference. You can choose what categories you would like to be seen on the app. You can choose your own goals you would like to meet. Having the ability to make the dashboard and goals match what you want, is just icing on the cake. The exercise tracker– When I run I use a Garmin. However, many times I plan to start a run and find my Garmin was not charged. 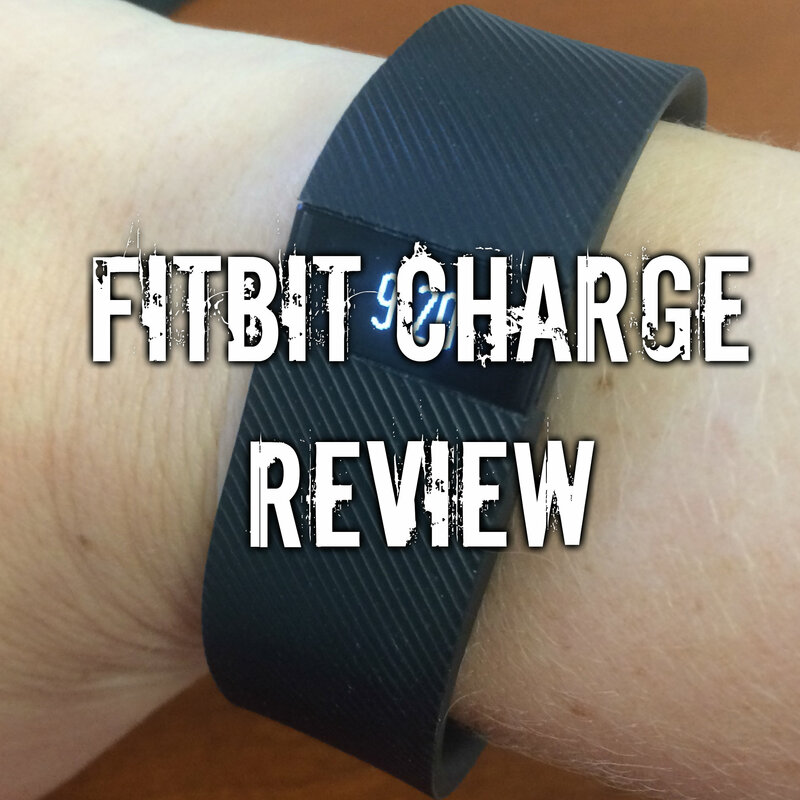 The Fitbit Charge offers an exercise tracker that tracks miles, time, and average pace. To start the timer, all you have to do is hold the button on the tracker down until it vibrates. This has been a great back-up for those days I do not have my Garmin. After you complete exercise it logs all information into your app. The look of the tracker– This would be my largest issue with wearing the tracker every day. I have no issues wearing the tracker with workout clothes when teaching but definitely find it unappealing with 95% of my work outfits. The black industrial band isn’t a great compliment to the bright, floral dresses you find me in at work. I loved that Tory Burch has created options to put Fitbit trackers in a fashionable piece of jewelry but the options are only available for the Fitbit Flex. I have high hopes that Tory Burch will extend their products to include other Fitbit trackers. You can bet I’ll buy one to make my Charge look just a little more fashionable. Adding friends on the app– One of the complaints other Fitbit users agree with me on is the difficulty of adding/finding friends on the app. The app allows you to challenge and compete with your friends but the only way to find and add a friend is through their email address. I have many students who wear Fitbit that I would love to challenge. I don’t know many email addresses and therefore have not been able to add many people. I wish that the Fitbit would have additional options to finding and adding friends. Do you use a fitness tracker? If so, what tracker do you use? Why? This entry was posted in Fitbit, Fitness, Health, Running and tagged Fitbit, Fitness, Health, Running. Bookmark the permalink.